Are you searching for the wine cooler with a small storage capacity which consumes less space? Then check out this Countertop wine cooler reviews which give the information regarding the top 10 products in the countertop specification. The Countertop wine cooler occupies less space and enhances the look of the decor. If you are a wine enthusiast and want to start your wine collection, then these countertop wine coolers are here to satisfy your requirements. In these countertop wine coolers, we can store both red and white wines by their wide temperature range. There are two types of cooling system one is thermoelectric, and other is the compressor. Different wine requires different temperatures to maintain the consistency of the wine. For this specification, the wine coolers come with a broad temperature range to store both red and white wines. Most of the countertop wine coolers have the Thermoelectric cooling system. The Wine Enthusiast wine chiller is one of the best countertop wine coolers. This fridge is very compact, lightweight and portable. The smoked-glass door with stainless steel trimming completes the design which enhances the look of the refrigerator. The weight and dimensions of the Wine Enthusiast 6-bottle wine cooler are 30 lbs and 16 x 10.5 x 19.6 respectively. The thermoelectric cooling system is free of CFC’s which makes it an eco-friendly cooler. For an effective visualization of your wine collection, LED-based interior lights are at your handy. 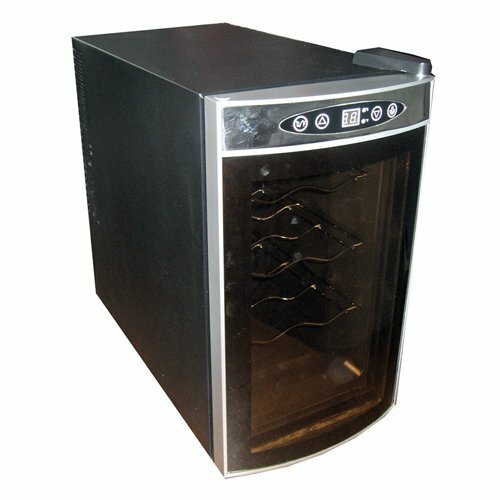 One year warranty is offered for this efficient and affordable wine cooler. The temperature ranges from 46-66 degree Fahrenheit for Wine Enthusiast wine chiller. This wine cooler is portable can easily fit in any corner of the room. You can easily arrange this wine cooler by adjusted the interior as per your wish. Easy to monitor and control touch-screen digital display. Stylish exterior and visible interior which makes it an elegant wine chiller. 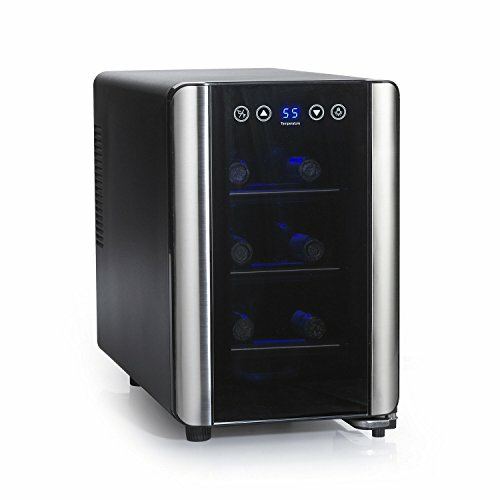 The Wine Enthusiast wine cooler has a wide temperature range. As this wine fridge has no reversible door, we have fewer placement options. Can be a bit noisy sometimes. In this wine cooler, you can store four bottles vertically, i.e. ; you can place the wine bottles opened or re-corked. By this single zone wine chiller you can cool and serve upto 12 bottles. 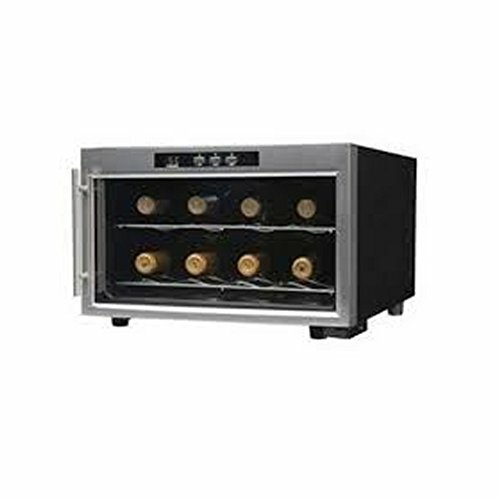 This Avanti Countertop Wine Cooler 12-bottle is an exemplify by compact design with stylish insulated double-panned glass door. It can easily fit in any space because it is lightweight and compact. The Avanti 12-bottle Thermoelectric Wine Chiller comes with one year warranty. This chiller weighs about 27lbs with dimensions of 25.25 x 10 x 20.25 inches. As this Avanti cooler, consumes less power we can call it as an efficient wine chiller. The internal temperature in the refrigerator is affected by outside conditions. 56-81 degree Fahrenheit is the temperature range of this wine cooler. You can store your opened wines upright which is an outstanding feature where other wine coolers may not support. The classy digital display and concave glass door intensifies the design. By setting the temperature to 56F, you can store both red and white wines. The temperature display comes in both the temperature scales, i.e., Celsius and Fahrenheit. The compact design of this wine chiller does not occupy more space. The power usage of the Avanti 12-bottle wine cooler is very moderate. The cooler is not provided with a lock which is a disappointing factor. Lights automatically turn off after 10 minutes which is not adjustable. The internal temperature depends on the outside conditions. This Haier 6-bottle wine chiller is one of the best-looking wine refrigerators. By this chiller, you can have a classy display of six wine bottles. The front-facing door spellbound everyone with its look. The recessed door handle enhances the look of the wine fridge. This countertop wine refrigerator helps to intensify the look of the room. Beautiful blue interior LED lights are useful to brighten your wine collection. The dimensions of this wine chiller are 9.9 x 14.1 x 20.3 inches and weigh about 17.6lbs. The company offers warranty in two types, i.e., one year for domestic use and 90-days for rental and commercial use. If you have left the door opened for the long time the temperature automatically adjusts when we close the door. The temperature ranges from 45 to 55 degree Fahrenheit in this single zone wine cooler. We can store odd-sized bottles in this wine chiller. Some of your re-corked bottles can also be rechilled correctly. 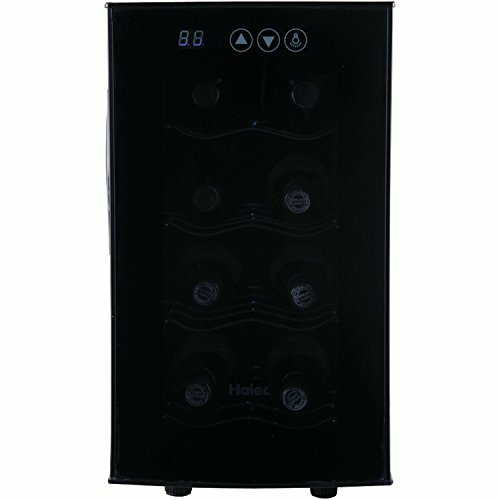 We can easily control and set the temperatures of Haier 6-bottle Wine chiller by the digital display. The wide temperature range uses to cool the desired wines at an ideal temperature. 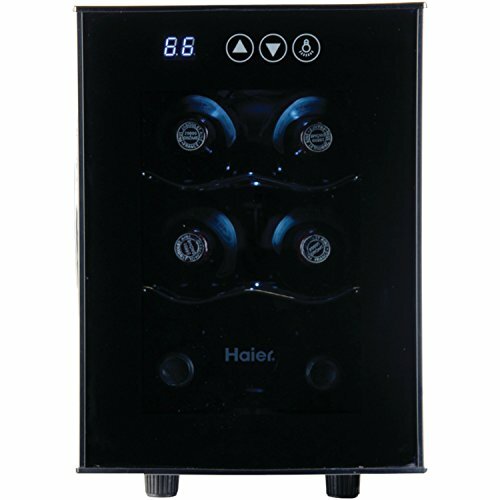 You can have a beautiful display of your wine collection with this Haier wine cooler. The thermoelectric cooling system helps for a vibration-free and silent operation. This wine refrigerator holds the desired temperature. We can save the electricity power as much as possible by this wine chiller because of its smart electrical usage technology. The LCD digital display gives a clear vision of your temperature setting. Sometimes the Haier 6-bottle wine chiller may be noisy. The odd-sized bottles may not be perfectly fitted. We can store upto 6-bottles which come with three pull-out chrome shelves. The design comes with double paned, tinted glass door which supports for enhancing the look of wine chiller. The cooler can be placed on the top of the kitchen counter because of its compact design. 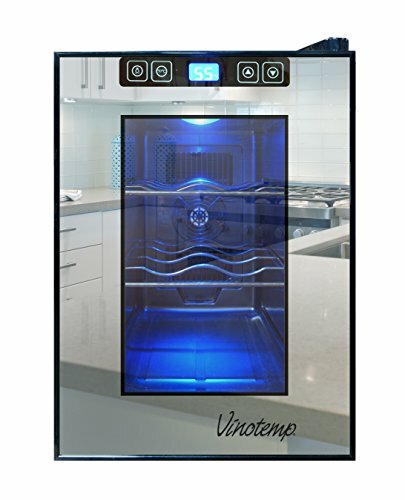 The temperature range of this Vinotemp 6-bottle Countertop wine cooler is 44 – 66 degree Fahrenheit. We can easily set the temperature controls by the touch screen control panels. This design of the wine chiller makes it a showpiece in any room. This wine cooler comes with sleek and wall mounted design. The thermoelectric cooling system makes the chiller eco-friendly. Interior lighting serves the purpose of illuminating your wine assortment. The Vinotemp 6-bottle weighs about 28 pounds and has dimensions of 16 x 7 x 30 inches. 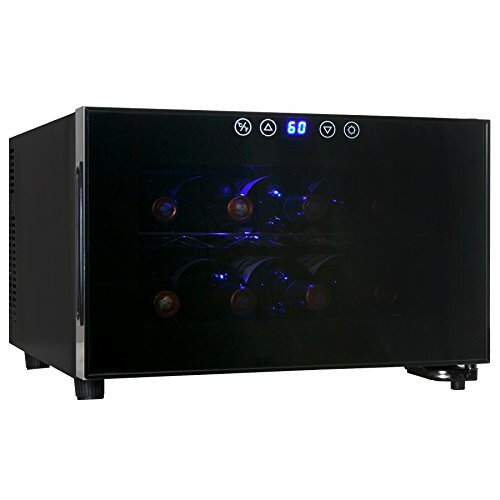 In this Vinotemp 6-bottle Wine cooler, we can observe the vibration-free and silent operation. We can see the vibration-free and quiet operation in this wine chiller by the thermoelectric cooling system. Helps to store a single type of wine at the perfect temperature. By the touch screen controls, we can easily set and monitor the temperatures. We can store different types of wine at the perfect temperature by the wide range of temperature. As this Haier wine chiller is portable and lightweight, we can place it and move the wine cooler quickly if necessary. Sometimes the working of the wine fridge may be riotous. Odd-sized bottles may not fit in the Vinotemp 6-bottle Countertop wine refrigerator. 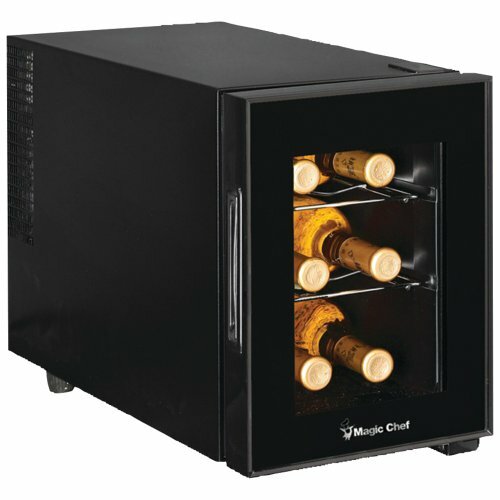 The Magic Chef 6-bottle wine cooler helps to store a small amount of your wine collection at the perfect temperature. This wine chiller adds an extra appealing to your home by the contemporary and sleek design. The easy to use digital controls helps to conserve power. We can store both types of the wines by the temperature range of 46 and 66 degrees Fahrenheit. To accommodate standard wine bottles we have two sculpted chrome shelves. The reason behind the silent operation of the wine chiller is the thermoelectric cooling system. The LED lights help to illuminate the contents of the wine refrigerator. Adjustable Thermostat helps to store both red and white wines where the temperature ranges between 46-66 degree Fahrenheit. The thermoelectric cooling system helps for quiet operation. We can adjust the leveling legs. The temperature display comes in both Celsius and Fahrenheit. The Double-panned glass door protects from UV rays and other harmful elements. This chiller will not look right in the living areas of the room, so we prefer to place this unit in the kitchen. The Danby 6-bottle Wine chiller is compact and has an extreme efficiency of energy. The interior LED lights help to show off your wine collection. The Danby 6 Bottle Countertop Wine Cooler contributes to store six bottles at a perfect temperature. The interior light assists to showcase our favorite wine assortment. The compressor cooling technology maintains quiet operation. A one-year warranty is granted to Danby 6-bottle countertop wine refrigerator. Setting of temperature as per our wish is done through Digital LED Thermostat temperature display screen. Three sculpted chrome shelves tend the wine. This chiller is a very better option if you have a small wine variety. Danby Wine Chiller is very economical. This Countertop wine refrigerator can be placed without occupying a lot of space. The Danby 6-bottle Wine Chiller is very easy to control and access. It helps to conserve power. Differentiation in temperatures of upper and lower rack. Generates excessive vibrations and loud noise which may cause some distractions. In the case of any power fluctuations the previous settings of the cooler are lost. 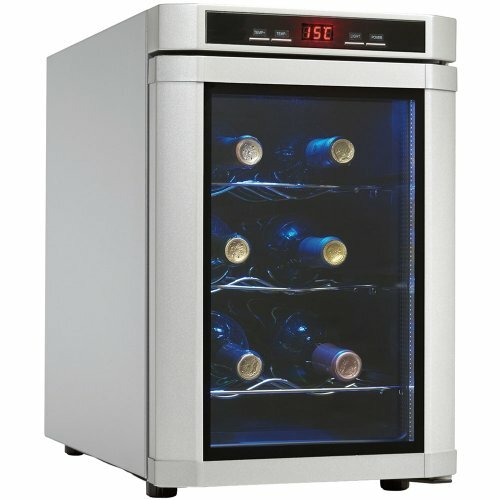 The Emerson 8-bottle countertop wine cooler is one of the stylish looking fridges which pleases every wine lover. The wine chiller is inexpensive and compact enough and can fit in any corner of the room. The thermoelectric cooling system supports for vibration-free and silent operation. The glass door helps to dissipate the heat. If the surface is not in level, then adjustable legs aid for an easy installation of this countertop wine refrigerator. The LCD supports for easy visualization of settings whereas the soft interior lights contribute to show off your wine collection. The 90 days warranty is offered to this wine chiller. The weight and dimensions of the wine cooler are 22lbs and 14 x 19 x 23 respectively. The thermoelectric cooling system supports for silent and vibration-free operation. The Emerson 8-bottle has a stylish look which helps to intensify the look of the cooler. This wine refrigerator is an inexpensive one. LCD and soft interior lights add look to this wine refrigerator. The tempered glass door fulfills protection from UV rays and harmful elements. Adjustable level legs help to install this wine chiller even on the uneven surface. The reliability problems are frequently observed in this wine refrigerator. The wine cooler has limited capacity, i.e., of only 8-bottles. The temperature may not be accurate. The AKDY 8-bottle is one the best countertop wine chiller which helps to store a small amount of your wine collection. 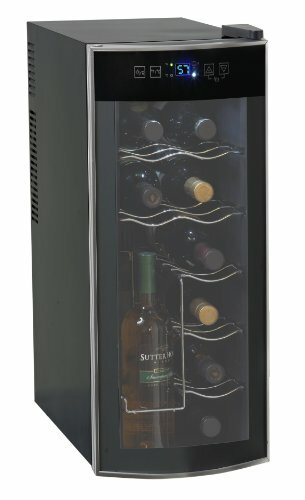 The design of this wine cooler is unified with silver cabinet and stainless steel black door trim. We can observe silent and vibration-free mechanism through the thermoelectric cooling system. By the single zone wine cooler we can store either red or white wine. This wine chiller is an eco-friendly product. The interior blue LED lights illuminate our wine collection. You can have a natural aid to your wine collection by which you can quickly grab you favorite red or white wine. The temperature ranges between 44-66o Fahrenheit. The adjustable leveling legs help to install the wine chiller even on the uneven surface. The overall weight of AKDY wine cooler is 20.5lbs and dimensions of 16.14 x 20.27 x 10.83 inches. The manufacturer provides one Year warranty. The mirror finish on the door helps to enhance the look of the wine chiller. This wine chiller is a freestanding wine cooler. The adjustable leveling legs help to balance the wine cooler on the uneven surface. Two metal shelves support for an easy cleaning and maintenance of the wine chiller. Can only hold eight standard sized bottles. It can store either red or white wine. The Haier 8-bottle Wine Fridge helps to enjoy your aging wine. The thermoelectric wine cooler incredibly produces lower noise. We can store wine at average temperatures. The compressor cooling system contributes to store wine at perfect temperatures. We can store both red and white wines. The metallic black body adds to the overall look of this Haier 8-bottle Wine refrigerator. The electronic thermostat is fully adjustable by which we can adjust the controls as per our wish, whereas the blue LED helps for easy visualization of thermostat levels. You can serve your wines at ideal serving temperatures. The digital control panel assists for basic settings. The Haier 8-bottle wine chiller boosts your decor by its smart design. We can observe Noise-free and vibration free cooling. Digital controls add a stylish look of this wine chiller. We do not recommend this product for commercial use. Koolatron wine cooler can hold 8-bottles of your favorite wine collection. This wine fridge uses the thermoelectric cooling system to for vibration-free and silent operation. The digital controls help to store the setting that you have given to the chiller. You can quickly set the internal temperature of the wine fridge by the digital temperature. By the Koolatron 8-bottle wine refrigerator you can store your favorite wines at the perfect temperature. Soft interior lights help to highlight your assortment of wine. The thermoelectric cooling system contributes to keeping your wine without losing the sediment in the wine. You can easily adjust and maintain the internal temperature of the chiller. The Haier 8-bottle wine refrigerator has an attractive design. This wine fridge maintains the particular temperature. The cooler also features double-panned, insulated glass door which intensifies the chiller look. Sometimes we cannot adjust shelving. Thank you for considering this Countertop wine cooler reviews. I assume this is a helpful study. The countertop wine coolers do not occupy more space and can easily fit in any room. You can store the small amount of your wine collection in this countertop wine coolers. These wine chillers are available for a low cost where everyone can afford this type of refrigerators and can enjoy your favorite red or white wine. Difference between Wine Cooler and Refrigerator | Which one is better?